Largest Desert in the World. The Karakum Desert, also spelled Kara Kum and Gara Gum (Turkmen: Garagum, Russian: ??????? ?, Kazakh: ???????) 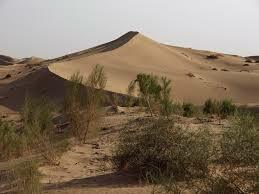 is a desert in Central Asia. Its name means Black Sand in Turkic languages. It occupies about 70 percent, or 350,000 km?, of the area of Turkmenistan.The population is sparse, with an average of one person per 6.5 km? (one person per 2.5 square miles). Rainfall is equally sparse, ranging from 70 to 150 mm.Covering much of present day Turkmenistan, the Karakum Desert lies east of the Caspian Sea, with the Aral Sea to the north and the Amu Darya river and the Kyzyl Kum desert to the northeast. In modern times, with the shrinking of the Aral Sea, the extended Aral Karakum has appeared on the former seabed, with an estimated area of 15,440 sq mi/40,000 km?. Although the level of the Aral Sea has fluctuated over its existence, the most recent level drop was caused by the former Soviet Union building massive irrigation projects in the region. Although the North Aral Sea is currently rising, the South Aral Sea is still dropping, thus expanding the size of the desert.